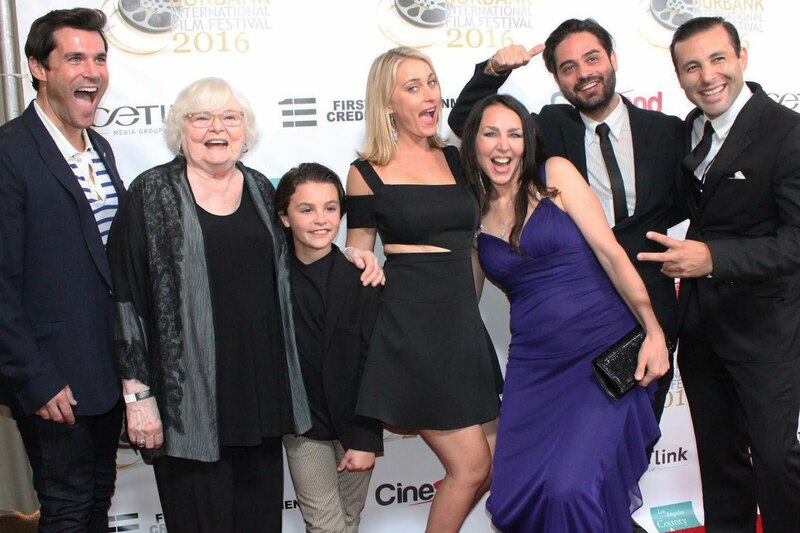 ‘The Visit’, a dramatic short film starring Academy Award Nominee June Squibb (‘Nebraska’, ‘About Schmidt’) and Sean Maher (‘Firefly’, ‘Serenity’), written, directed and produced by Argentine filmmaker Romina Schwedler, premiered this September at AMC Burbank 16 Theaters as part of the Burbank International Film Festival. The piece was awarded ‘Best Short Film by a Woman’, having come full circle for Schwedler and Squibb as it was at the same festival’s award ceremony two years ago that the new director approached the legendary actress with a flash drive containing the script for the film. ‘The Visit’ explores mental health issues through an encounter between a man and his aging mother. Hi Romina, it’s great catching up with you in between your busy schedule. Congratulations on The Visit’s premiere and award. This must have been extremely thrilling! Thank you, it really was. On one hand, this was the culmination of almost two years of nonstop work between first draft and final cut, so having my cast and crew reunited to see the film on the big screen was a treat in and of itself, but then the audience’s enthusiasm made it that much more special for everyone involved in the project. There comes a point during post-production when you and your team cannot possibly be objective anymore and it becomes a mystery how a real audience will react to the film. Will they love it? Hate it? Will they remember it after the festival is over? But the reactions we got were heartfelt, sincere and far beyond what anyone expected, so I couldn’t be happier about that night. And as if this wasn’t enough, my family was there with me all the way from Argentina. They have been extremely supportive of me and this project and sharing that evening with them was a dream come true. So the award on top of it was not only a great honor, but also an unforgettable start to what I hope will be a successful festival circuit. How was the process of casting two great actors like June Squibb and Sean Maher? I understand there is quite a unique story attached to getting June to be a part of the film. Yes, I am so lucky to have had the chance to work with such high caliber talent. June and Sean are not only exceptional actors but they were also wonderful to work with. They truly went out of their way to make their characters come to life and to make sure that I had what I needed. The same goes for supporting actors Sadie Katz and Dominick Coniglio who also did an outstanding job. I saw the film ‘Nebraska’ as I was writing the second draft of my script and was truly taken by June Squibb’s performance; so much so, that from that moment on, as I wrote each line of dialogue for one of the main characters, I couldn’t help but see her face and hear her voice. When the screenplay was completed I thought, “why not reach out to her agent?” So I did, but I did not receive a response (I learned later that the agency was moving at the time and most likely never received my messages). However, weeks later, serendipity kicked in when I found out that my branded content/ micro-short ‘How a Man Gets Ready’ had been nominated for an award at the Burbank International Film Festival where June was scheduled to be a presenter! So I came up with a plan to get that script into her hands: I put the file on a flash drive along with a brief video of myself asking her to please read the story. I taped the drive to my business card and then, on the big night walked up to her table. She probably thought I was nuts but she was gracious and kind and she promised that she would read it. My heart was beating out of my chest as I walked back to my table. Three weeks later, I received the nicest email from her… CUT TO: Here we are! With Sean the process was a bit more traditional, I suppose. His manager contacted me when he saw the audition notice I had posted for the role and said that Sean was interested in reading the script. Sean has a particular appreciation for June’s work as well, so the project had caught his attention. When this happened, I had already held all the auditions and callbacks for the role, and after a very difficult process I was finally down to two actors although not really 100% set on either. So when that call came in (on the exact day I was supposed to notify the selected actor) it was serendipity all over again, because I couldn’t have asked for a better ‘Ben’. In fact, not surprisingly Sean received a best actor nomination for it. However, it wasn’t easy. Everybody loves Sean, everybody loves June. These are two busy actors. So getting everyone’s schedule coordinated, considering –among other things- that we were on opposite sides of the country, was challenging to say the least, but somehow we made it happen! Without giving too much away, give us an idea of what ‘The Visit’ is about. 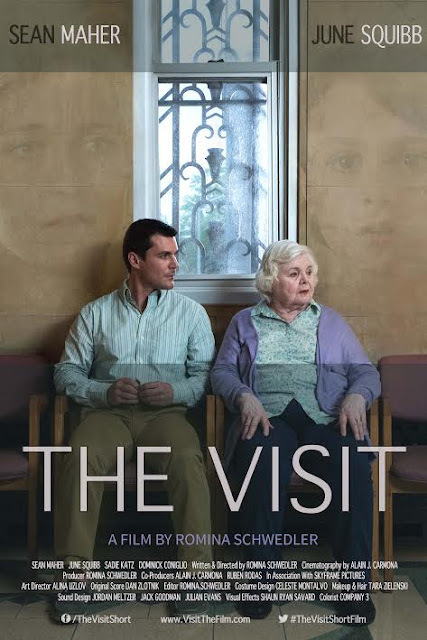 ‘The Visit’ is the story of a family changed forever by an unfortunate chain of events in connection with the questionable past of Ben (Sean Maher), husband of a hardworking and hardheaded woman (Sadie Katz), and father of a seven-year-old boy (Dominick Coniglio). June Squibb plays Ben’s mom, and the story is told through an encounter between them at the visiting area of a public hospital as well as through Ben’s memories. Two of the main themes explored in the film are loss and denial. Your debut piece ‘How a Man Gets Ready’ won multiple awards and played for diverse audiences around the world, besides getting you selected as one of the top emerging directors of 2014 by the prestigious ‘SHOOT Magazine New Directors Showcase’. How did you get into filmmaking? Also, what do you remember most about that very first production? Was it both nerve-racking and exciting? I actually sort of stumbled into filmmaking. I had been performing since I was about 10. 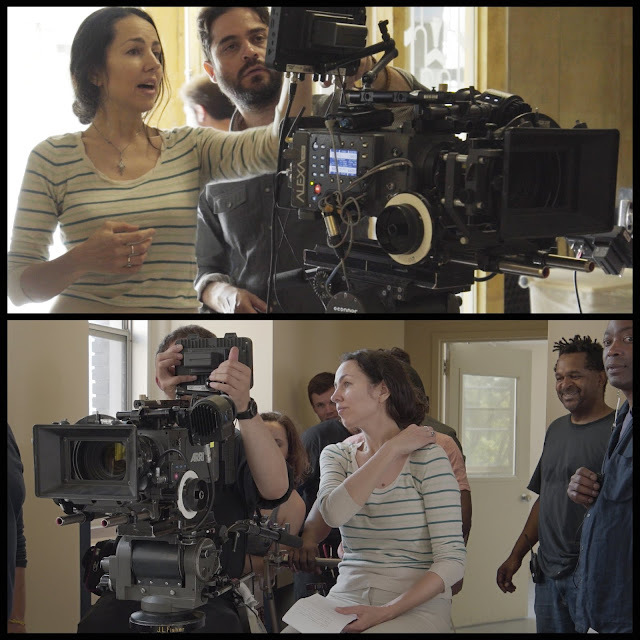 I started out as a ballerina back in Buenos Aires, Argentina (where I was born and raised) and then continued with singing and acting lessons, which in turn paved the way for me to become a filmmaker. Just about the time when my ballet career was starting to take off in NY, I had a dance related surgery after which I had to stop dancing for almost a year without any assurance that I’d be able to dance again. So, during that year I decided to expand my artistic training with music lessons at Juilliard and acting lessons at the William Esper Studio. I was so excited to be expressing myself in this new way that I actually continued on that path and never looked back; even though my ballet background undoubtedly influences any work that I do today. I acted for several years until one day I thought of this idea for a commercial (where I would play one of the roles), which I thought might be fun to get produced in order to have something different to show my agent, new directors, etc. So I wrote it and then asked someone I had recently worked with if he would like to be the DP on the project. He loved the concept, so I did the casting, prepped the wardrobe, scouted locations, and we shot it! I had learned quite a bit about filmmaking from being on set as an actress so I actually felt pretty comfortable from the get-go. I wasn’t necessarily conscious of the fact that this was my ‘directorial debut’ though. I was just communicating to my cast and crew what I had in mind for each shot and what I thought would be the best way to achieve it. So to answer your question, I was definitely excited but I wasn’t nervous. I felt like I was playing, and this was –or so I thought- just something new for my acting reel. But I loved every minute of it, including pre & post-production, so when I was done I just couldn’t wait to do it again. When and why did you make the decision of moving to the United States? I traveled to NY when I was 15 years old because I had been invited by the School of American Ballet. This was every young dancer’s dream and it was certainly mine, so my parents supported my decision both morally and –through great efforts- also financially. But we didn’t know that this would lead to me moving here permanently -at such a young age- by myself. I was just taking things one step at a time and somehow, different opportunities would come up to keep me in NY year after year. People ask me if I was a runaway because 15 years old is a pretty crazy age for a girl to move to one of the toughest cities in the world without knowing anybody or any English! I didn’t think it was crazy then, but I know it was crazy now. It was all the contrary to running away though. I missed my family so much, still do, but this was the place where I felt I should continue my creative path, and I guess my parents trusted the way they had brought me up, so despite this being super difficult for them too, they did what they believed was best for me and for that I’m eternally grateful to them. I went through some really difficult times and crazy situations to say the least, but I managed to come out of it in one piece and it all shaped the person I am today, so I would do it all over again. Who were some of your inspirations in the film industry, growing up? Well, growing up I had no idea that I would end up making films so I experienced them in a completely different way than I do today. What remains the same though, is that I couldn’t get enough of them! I especially loved the work of Hitchcock, Kubrick, Nolan, Lynch, Allen and later on Linklater. They all in different ways, made me feel understood through their storytelling. I’m finding it fun to now go back to some of the films that made an impact on me then, like ‘2001 Space Odyssey’, and studying them from a different perspective. I also love everything that has to do with the human psyche so my favorite films have often been psychological dramas or thrillers. But I enjoy other styles too of course, and can’t help but also mention Chaplin, Fellini, Tornatore, Goddard, Puenzo, Subiela, Almodovar. I could go on of course! What has been your favorite production to work on so far and why? This is a tough question. I definitely have favorite aspects of each production I’ve worked on, but picking one over another feels like deciding whether you love your mom or your dad more, or one of your kids more than the other. What I can say is that ‘The Visit’ was definitely my most challenging production yet. A lot was at stake in this case. I was working with the highest budget, the largest cast, the largest crew, the most difficult locations and the most difficult ‘everything’ I had ever worked with, so it was a crazy experience but I absolutely loved it! How do you come up with your concepts and ideas when making a film and what inspired the idea for ‘The Visit’? The idea for ‘The Visit’ came from a phone conversation with my father where he shared that my late great aunt (at the time 102) had been telling him about this party she was supposed to attend where her parents and her sister were going to be. Due to her advanced age she had lost all friends and family members from her generation so this was the way her brain helped her cope. As my father and I kept talking, an idea was triggered in my mind after which I could not think of anything else. I had to get the story written and produced. For each concept I’ve had, there has been a moment when something caught my attention and then an idea came to take that ‘something’ a bit farther. The less you’re thinking or looking for ideas the better, in my experience. Ideas can come from anywhere: A trip to the supermarket, the news, a frustrating argument, etc. So I think it’s important to be alert and connected to the world around you besides ‘being in your own world’. None of these are good without the other. With my boyfriend (who was also the cinematographer on ‘The Visit’ and my filmmaking mentor in so many ways), we try to immerse ourselves in diverse cultural activities that go beyond film, which we feel expands the mind in ways we’re not even aware of. So, we just try to not let too much time go by without a trip to MOMA, Lincoln Center or an Off-Broadway play. What other projects do you have coming up and what are your plans for the future? Right now I’m in the process of writing another short which I’d like to produce in the Spring/Summer of 2017; and I’ve written a feature screenplay that I’m totally psyched about and hope can be my next project after that. However, I’m currently in conversations for two directing jobs which -if they materialize- would postpone my own projects quite a bit. As far as the future goes, my plan is to continue making films and branded content, and to keep involving myself in diverse and inspiring projects. What is your best piece of advice to aspiring filmmakers? Go out and do it! And work really, really hard at making yourself a competent professional. Learn your craft, learn your history, stay up to date with the latest technologies, go to film festivals, help out on set anytime you can, and know that this is a 24/7 job! Your vision is like an infant child; its life depends on you. Last but certainly not least, use your voice wisely. As filmmakers, it is our privilege and our responsibility to contribute to making this a better world for everyone.